You might be the faster, lighter-footed guy in the ring making the audience go dizzy with your schmancy moves, but unless you can punch, chances are that your opponent is winning it between the ears! In Boxing, you’ve got to punch, and you’ve got to punch hard. It earns you the respect you deserve, helps you position yourself perfectly to land those follow-up punches and most importantly, keeps you alive for the duration of the fight. Only, punching like a beast doesn’t come naturally for some athletes. That’s where strength building exercises come into play. And we aren’t talking about mundane weight lifting exercises in the gym either. To build up your punching power, you’ve got to train smart! 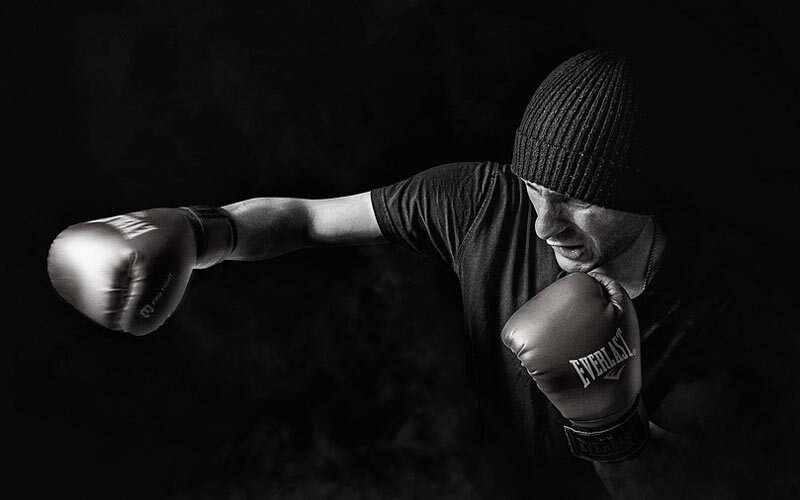 Here’s a mix of conventional, tried and tested and a few unconventional training methods that we borrow from martial arts that are going to help you build explosive strength in your punches. Start off with the legs. To throw strong, solid punches, you need to have a rock hard foundation. Your legs provide your upper body with the stability and the balance it needs while you are constantly on the move or even staying stationary trying to duck. Contrary to what’s popularized in old-school Boxing literature, don’t need to wake up in the am and sprint for 20 miles. Running is an aerobic exercise. Boxing is a predominantly anaerobic sport. This means that, most of the time in the ring, your muscles will be under tremendous stress without sufficient oxygen supply for short bursts of time. You’ve got to train your body to compensate for it. So, it is imperative that you include as much anaerobic exercises into your training routine as possible. For legs, you’ve got to include isokinetic, isotonic and isometrics anaerobic workouts. Squats are the gold standard. To make it better you can squat with a medicine ball. Include plyometric exercises. Lots of jumps, do some lunge variations, to hit the glutes. Target all leg muscles. In a scene from the latest Rocky movie, Sylvester Stallone’s trainer tells him that ‘Every time you hit him, it’s gotta feel like he tried to kiss the express train’. That sums up fist strength for you. There’s nothing like a rock hard fist to back up your strength with. Sadly, in boxing, it doesn’t get as much attention as it deserves. In fact, most other forms of martial arts attribute a lot more importance to fist strength. And we borrow this simple strength building exercise for your fists from Taekwondo. Get a tub of sand (or rice) and punch your hands through it with the fingers extended. Go gentle at first and gradually increase your force and speed. Once you can comfortably throw punches (fingertips first) through sand, you can start warming the sand. This makes it harder. Good old heavy bag workouts work great as well. If you have seen pro boxers move their head, you’ll realize the importance of the bob-and-weave technique. They can dodge punches like nobody’s business. When its punching time, this translates into a strong upper body that swings like a sledgehammer to deliver the punch. But in a long and tedious fight, with energy levels dwindling, it can become difficult to retain this upper body strength unless you train for it. Concentrate on exercises for the torso. Hold a medicine ball at eye level with both arms, relax your shoulders (no shrugging) and swing the upper body from side to side. Alternatively, you can also grab a baseball bat and swing hard at a heavy bag or a tire. That comes straight from the Pacman’s training routine by the way. Conventional heavy bag workouts focus on punching hard AT the bag. The trick is to punch through it. If you are punching at the bag instead of through it, you are kind of defeating the purpose of all that strength behind the punch. Think of it like a half-baked punch. Punch hard, punch clean and punch through it. That’s not pushing at the bag mind you. You will continue to use strong, snap punches. But you should feel the bag as you connect with it. Once you practice throwing punches through, focus on heavy bag workouts that allow you to make combination punches while moving around it. Overextending is a common problem mostly seen in boxers of shorter stature. To compensate for their short reach, they often overextend their punches, which does two things. Rather than overextending and wasting the potential of a precisely landed punch, practice the bob and weave technique, trying to dodge punches and moving forward at the same time. This helps you to get within reach of your opponent and launch a punch when its most effective. Reduce the distance that your punch has to travel before it finds meat. Use it like a bullet. Not a pole. Always bend your knees when you throw punches. Get into a crouching position, keep your legs firmly grounded on the ground and launch into the punch. The best exercise for helping build strength is the squat. But you can also practice wall squats to help improve your leg strength. Newbie boxers are often tensed on a big fight night. That’s understandable. But if their bodies are tight and heavy, which is what tension typically does, it affects movement, velocity and coordination. Instead, staying relaxed helps the punches to flow. You are light on your feet, your balance is perfect, your weight is transferring back and forth seamlessly. That’s the right way to box. Float like a butterfly and sting like a bee! Practice deep breathing and relaxation techniques. An added advantage is that it helps build lung strength as well. You don’t necessarily need to be a heavy handed fighter like Mike Tyson or George Foreman to be able to throw hard punches that hurt your opponent. Work on your strength, balance and co-ordination. Use a combination of slip bag and heavy bag workouts to hone your skills. With practice, you’ll get there.